Whether you use fresh or frozen berries, this wonderful pie recipe is sure to be a family favorite. Place the blueberries in a bowl and sprinkle them with lemon juice. Roll half of the crust to about 1/8" in thickness and fit it into a 9" pie plate. 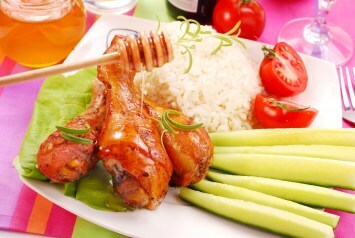 Combine the sugar, flour and spices and stir well. Add the flour mixture to the berries, stirring well to mix it all in. Pour the berry mixture into the pastry lined pie plate. Dot the filling with butter. Roll out the remaining crust to 1/8" thickness. Cover the pie with the crust. Trim the pastry around the edge of the pie pan. Seal and flute the edges. Cut slits in the crust top for steam to escape. Combine the egg yolk and water. Lightly brush the pastry top with the egg mixture. Bake at 400°F for 40-45 minutes or until golden brown. Cool before serving. 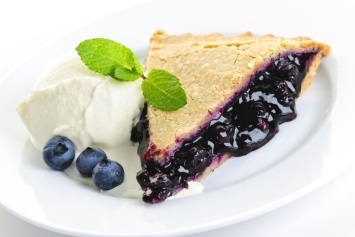 This blueberry pie is great served with a scoop of homemade vanilla ice cream. Blueberries grow wild here and it used to be that you could only get them if you lived nearby. Now, with the advent of global agriculture, these wonderful little blue gems are available to us year round, so we can enjoy a homemade pie made with fresh blueberries any time of the year. You can also use frozen blueberries for the pie. Just substitute an equal amount of frozen berries for the fresh. Pie pay not be the healthiest dessert to eat every day, but once in a while it is nice to have a treat like this. And especially when a star power food like blueberries are included. Blueberries are packed with vital nutrients and vitamins and certainly up the health content of pie. And they are so delicious! A double win. If blueberry pie evokes thoughts of warm summer days, you may also love our strawberry rhubarb pie. The recipe is here. I am new to your site and just love your recipes but I find that , like this one there is no mention as to what temperature to bake the pie!!! From Karen: The recipe says bake at 400 degrees. It is listed before the instructions, so the oven can preheat while you make the pie.